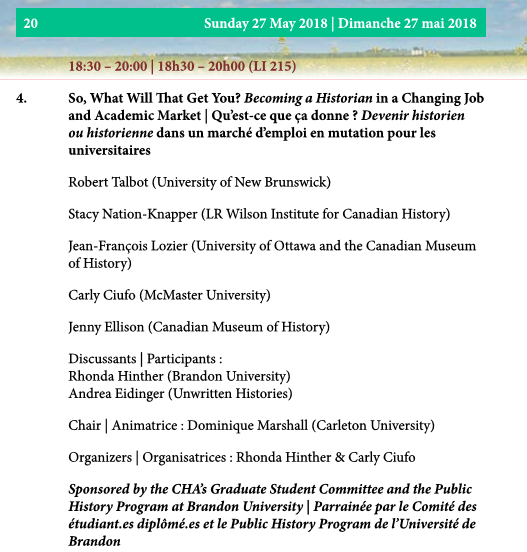 This post is one of several discussing the 2018 annual meeting of the Canadian Historical Association at the University of Regina, May 28-30, 2018. When I decided to pursue a PhD in history, I did not intend to remain in academia. Although now I sometimes daydream of being on the tenure-track, it’s hard to realistically envision a future where I will be able to make a stable living as an academic. Before returning to university in 2016, I was happily working in museums, archives, and libraries across the country. I was collaborating with people, listening to their stories, and seeking out content for some incredibly interesting collections and exhibitions. It was everything I wanted my life as a historian to be. But every now and then, I would be hit with the hard reality that contract-to-contract life was getting harder and harder to keep up. I could not move ahead in the work that I loved when competing applicants were equipped with the doctorate degree that I did not have. So, I started my PhD in the hopes that the degree would make me more competitive and better prepared for the secure senior research and curator positions that I desired. Alas, becoming a historian is not so straightforward. Now finishing up my second year of doctoral studies, it has become increasingly apparent that my post-graduate life will not be so seamless. Graduate students are regularly abandoning their degrees unfinished; some, with their PhD in hand, are leaving academia behind altogether for decidedly non-academic routes. Whether I choose to stay in or leave the university for research in the arts, culture, and heritage industry, these trends make me think that contract employment and precariousness may very well remain my only constant. Can any professional historian position realistically offer me the job security and permanence that I desire? And, to that end, how can history department cultures change to promote professional roles beyond the tenure-track professorships that today’s universities can rarely support? If we look at some of the important work that has been done by the Canadian Historical Association (CHA), the organization’s Becoming a Historian handbook is chockfull of useful information to meet many of the needs of emerging historians. Last published in 2007, however, it is in dire need of updates to reflect the field’s current—and future—realities. And so, on the evening of Sunday May 27th, the CHA’s Graduate Student Committee and the Public History Program at Brandon University are sponsoring a roundtable conversation on revising the handbook and on the profession at large. Before we settle into the annual meeting of the CHA proper at Congress in Regina, Saskatchewan, we therefore invite you to bring your thoughts, experiences, and solutions to a productive session on how to be a historian in today’s challenging climate. By bringing together tenure-track faculty, public historians, policy advisors, post-doctoral fellows, and students, our discussion will focus on preparing graduate students for forecasted changes in the academy and other job markets. We will also illuminate applicable skills, discuss current employment trends, and suggest more varied versions of success in the field of history. In doing so, we are seeking options on how to alter department environments that are often too focused on preparing their graduate students for tenure-track professor roles that far too few of them will ever get. All at different points in their careers, the panelists will talk about what becoming a historian tangibly means to them so that we can, together, start to offer suggestions for departments, universities, and professional associations to better support graduate students and post-doctoral historians upon graduation and beyond. We hope that you will join us for what promises to be a productive and provocative session. Carly Ciufo is Chair of the Graduate Student Committee of the Canadian Historical Association and a doctoral candidate at the LR Wilson Institute for Canadian History in the Department of History at McMaster University in Hamilton, Ontario. Her dissertation focuses on human rights museums and the people who build them. As an emerging museum professional, she has worked at the Canadian Museum for Human Rights, the Canadian Broadcasting Corporation, and the Canadian Museum of Immigration at Pier 21. Great post! A lot of the questions you bring up are many of the reasons I did not pursue my PhD. My track lead me to the profession of a Collections Manager of a large museum. A job that having a PhD would not make a difference, instead I need to attend practical workshops to acquire the skills I need. This begs the question, am I to consider myself an Historian? My MA was in History and I have definitely studied and kept up with the history filed. What makes one an Historian? To be honest, anytime I pursue research into any historical topic in the course of my work, I tend to feel guilty. To pursue research for the sake of academia almost feels self seeking to me, a luxury if you will. I will be curious to see what the round table comes up with.